Home / Needlework How to sew the skin by hand using tools and on a sewing machine? 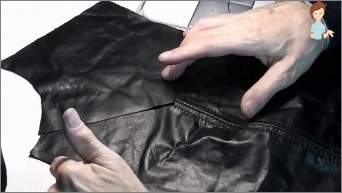 How to sew the skin by hand using tools and a sewing machine? How to sew the skin by hand? To do this, you need special tools, as well as a hook or a needle. 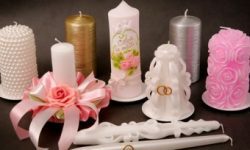 Connect parts can be seams over the edge, and you can "forward the needle"
Articles made of genuine leather at all timesValued very expensive, since the period of their operation is almost unlimited. But not every material can be sewn on a typewriter, and it is not always convenient to use it. 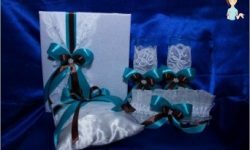 Therefore, many masters sew only by hand and the quality of their work remains at an altitude, and the price significantly exceeds the cost of products made by machine. You will need special tools - an awl, a punch and a hammer. Placing the material in the clamp, you can proceed to stitching. What kind of thread should be sewed? While performing a saddle-stitch, arm yourself with linen threads. Before use, they are recommended to be treated with wax, so that they repel dirt and easily pass through the holes in the material. Which needle should be sewed? You will need a sturdy blunt suture needle. The size of the ear also matters. 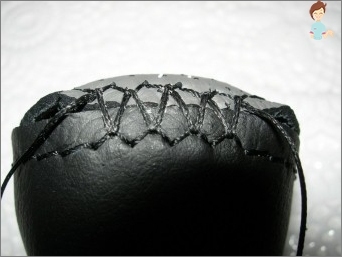 For example, a needle with a fourth eyelet size is suitable for making shoes. After pulling the short end of the thread, it should be screwed into a loop. This is to ensure that the thread does not jump off the needle. 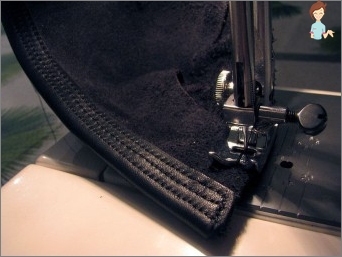 Now start to work by selecting the seam "Forward needle". You can sew two parts with two needlesAt the same time. In this case, one of the needles must be inserted into the last hole and dragged. The second pass through the second hole and pull it down. Now it needs to be inserted into the hole on the other side slightly higher than the first and dragged, pointing the pointed tip upward. Then both needles are inserted into the next hole and pulled through it. How to manually sew the skin? You can join the parts with a seam over the edge. With this method it can be quite difficult to fasten them in the clamp, so experienced workers give advice to glue details with PVA glue. 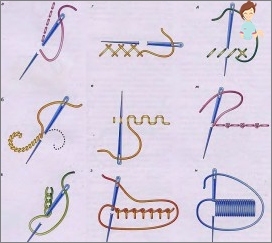 If, after reaching the end, you make two or three stitches with a needle, moving back, you do not have to make nodules. It is enough to cut the thread near the surface. When working with nylon thread nails, you canTo melt, and then they definitely will not dissolve. We sew a bag from a genuine leather: this method can sew not only shoes, but also a bag that will serve you for more than one year. If you do not have a needle near you, you canLearn how to sew with an awl. That is, use it not only to make holes in the material, but also to push the thread. Although this is not the best solution, since the thread is easy to damage. At the end of work, as soon as the first doneYou stitch touches the last, take 3-4 steps in the opposite direction, and push the thread not into new holes, but those that you already have. How to sew natural leather on the typewriter? On ordinary household sewing equipment it is quite possible to sew such material, but only not too thick. To process the belt, of course, it can not, but the skin, with a thickness of 1 to 1.5 mm, will be able to take. But for this it needs to create certain conditions. If the conveyor does not cope with the progressMaterial, you need to purchase a special teflon, roller or fluoroplastic foot. Some try to get out of the situation and sprinkle a pattern with talc, oil with oil or simply with hands to help it advance. You can try all these methods, and still as an option, it is recommended to sew over the tracing paper, but this is not very convenient. It is very important to properly sew the skin, especially suede. If you do not take into account the direction of the pile, the cut parts will differ in color. To iron a surface it is necessary only from the wrong side, and the iron should not be strongly hot and throw out steam. 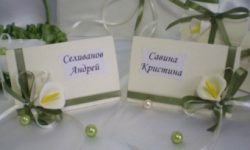 Do not forget to put a plain cotton cloth. Remember that when you work on the machine, the seam is not fixed backward, which means that you have to fix the ends of the threads with several knots. Working with the skin is almost always associated with the treatment with glue. Glue can be applied with a brush only on the cleaned surface and previously freed from fat. The most commonly used adhesive "Moment", Rubber composition or PVA. The finished parts must be allowed to dry, and then to be connected and always put under a press. Remove excess glutinous solution with a cotton swab or rags. Knowing these rules of working with the skin, you will not spoil the material, but only improve its properties and qualities. Good luck!